Please join us on Saturday, March 9, for the alumnae luncheon. The luncheon will take place at 11:00 am before the matinee performance of Red & Gold, Between the Lines. 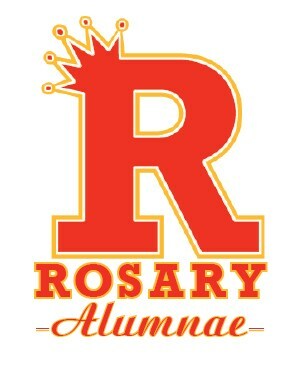 This is a great opportunity to reconnect with your fellow sisters and watch one of Rosary's most beloved traditions, Red & Gold! Tickets for the luncheon are $15 and performance tickets are $20. To purchase your tickets today, please go to www.rosaryacademy.org/redandgold. Save the date for, Thursday, March 21, 2019, for Sophomore Professional Development Day, formerly Career Day. Working in conjunction with the counseling department, sophomores complete the Myers-Briggs questionnaire in January, so our goal is to align career exploration with this grade. We are also extending programming for an entire day to include workshops in communication, developing leadership skills, etc. The goal of Speak to Inspire is to have alumnae engage with a focused group of students who are interested in learning about career industries. This is a great opportunity for our Royals to be inspired by alumnae who are successful professionals in their field. These sessions will take place on a Thursday morning from 7:45 a.m. – 8:45 a.m. If you or someone you know would like to speak, please contact Maggie La Bonte. Thank you to all of the alumnae who showed interest in being a mentor. As a reminder to all mentors, please save the date for Friday, September 28, at 7:00 a.m. for the kick-off breakfast! Please check your email for program information. If you are still interested in being a mentor, contact Maggie La Bonte, to be added to the waiting list. If you are interested in being on the Alumnae Association Board, please contact Maggie La Bonte. All names will be considered and approved by the school administration. Please click here for a listing of board positions and the description of each position.